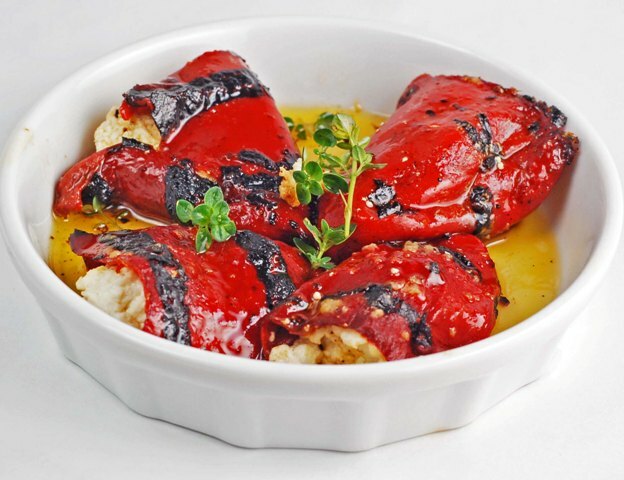 Sweet, smokey, fire roasted Piquillo Peppers are stuffed with tangy goat cheese, drizzled with olive oil, fresh garlic, and lemon thyme. This recipe for Piquillo Peppers stuffed with Goat Cheese makes a wonderful appetizer or even a simple and light dinner when paired with a salad. I took this idea from Jacqueline and more or less just ran with it. I love tapas, the idea of sharing many dishes amongst everyone is enticing. Laudalino is not as big as a fan as I am, he says it is small portions, that are too expensive and it leaves his stomach and wallet empty. He is traveling this week so I figured this would make the perfect light dinner when paired with a baby lettuce salad and a hearty glass of red wine. Stuff the peppers with the goat cheese, lay in an ovenproof dish. Drizzle with olive oil and microplane garlic over the top. Bake until the olive oil is slightly bubbling and the cheese is warm and creamy, between 5 – 8 minutes. Do not overcook or the cheese will fall apart. Sprinkle with thyme and sea salt. 10 Responses to "Piquillo Peppers stuffed with Goat Cheese"
Beautiful stuffed piquillos! I love this dish, and yours looks great. This looks yummy. I made a similar version a few months' back (but regretfully, didn't write it down). I love this...ordered it at a tapas place and could eat it every day! These look delicious. What a great appetizer for a dinner party. I love tapas-style eating too! I'd rather taste small bits of a lot of different things :) These are delicious! Tapas, mezedes (Greek), appetizers...love them...the night is long, the food plenty and the drink - flowing. Roasted red peppers are my fave! Like the song...these are a few of my favorite things! This would be a great summer starter.